Northwestern Mutual employees are wild over the Milwaukee County Zoo’s birth announcement of the western lowland male gorilla born on November 24, 2014. In partnership with the Northwestern Mutual Foundation, the Milwaukee County Zoo and the Zoological Society of Milwaukee have been transforming the Outdoor Gorilla Exhibit to create a more enriching habitat for the resident gorilla troop. The newly renovated exhibit will open this spring. Through this partnership, the Zoological Society of Milwaukee presented Northwestern Mutual employees the opportunity to name the new male baby gorilla. After a seven day social media campaign, employees have selected Sulaiman as the winning name for the gorilla. More than 1,200 Northwestern Mutual employees cast their vote through its internal social media network platform. 32 percent of votes were given to Sulaiman. 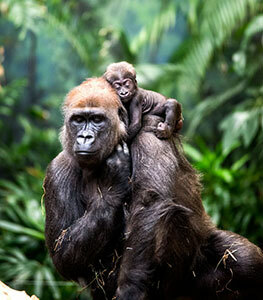 The baby gorilla is the first offspring for mother, Shalia, who will be 13-years-old in February. She is on breeding loan from the Toronto Zoo. The father, Cassius is 27-years-old and has been at the Zoo since 1999. The Milwaukee County Zoo is home to more than 3,000 mammals, birds, fish, amphibians and reptiles, with more than 420 species represented. Recognized as one of the country’s finest zoological attractions, it serves as a resource to the surrounding communities and beyond. The mission of the Northwestern Mutual Foundation is to improve the lives of children and families in need. The Foundation has given nearly $270 million since its inception in 1992 and is designed to create lasting impact in the communities where the company's employees and financial representatives live and work. We accomplish this by combining financial support, volunteerism, thought leadership and convening community partners to deliver the best outcomes. Our efforts are focused nationally on curing childhood cancer, and locally on education, neighborhoods and making our hometown of Milwaukee a great destination. Northwestern Mutual has been helping families and businesses achieve financial security for nearly 160 years. Our financial representatives build relationships with clients through a distinctive planning approach that integrates risk management with wealth accumulation, preservation and distribution. With more than $217 billion in assets, $26 billion in revenues and more than $1.5 trillion worth of life insurance protection in force, Northwestern Mutual delivers financial security to more than 4.2 million people who rely on us for insurance and investment solutions, including life, disability and long-term care insurance; annuities; trust services; mutual funds; and investment advisory products and services. Northwestern Mutual is the marketing name for The Northwestern Mutual Life Insurance Company, Milwaukee, WI, and its subsidiaries. Northwestern Mutual and its subsidiaries offer a comprehensive approach to financial security solutions including: life insurance, long-term care insurance, disability income insurance, annuities, investment products, and advisory products and services. Subsidiaries include Northwestern Mutual Investment Services, LLC, broker-dealer, registered investment adviser, member FINRA and SIPC; the Northwestern Mutual Wealth Management Company, limited purpose federal savings bank; and Northwestern Long Term Care Insurance Company.